Fat Charlie Nancy’s greatest fear is being embarrassed. Unfortunately for him, he had a father that was even better than fathers normally are at embarrassing his son. When Fat Charlie’s fiancée, Rosie, suggests they should invite him to their upcoming wedding, he can only think of the many forms of excruciating embarrassment this will probably lead to. At Rosie’s insistence, however, he calls Florida to try and locate his father, only to learn that he has just passed away. He crosses the Atlantic to attend the funeral, and learns that one, his father was no ordinary man, but the West African and Caribbean trickster god Anansi (readers of American Gods will have met him as Mr. Nancy); and two, that he has a brother by the name of Spider, and that if he wants to meet him all he has to do is tell a spider. Fat Charlie does so, and soon realizes that meeting Spider will change his life in more ways than he could have imagined. 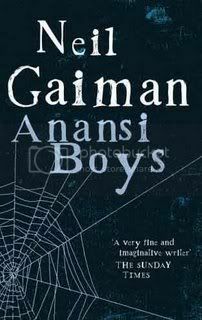 I think that if you were to ask me right now, I would say that Anansi Boys is my favourite Neil Gaiman novel. (The answer would probably change in a few days, though. My favourite Neil Gaiman novel tends to be the last one I've read. The same often happens with Terry Pratchett. They’re my favourite authors for a reason, after all.) I had forgotten just how much I love this book, and just how many things I love about it. I love the Caribbean mood, for starters. I love the language and the folklore and the settings and the ambience. I love the characters: Fat Charlie, Spider, Rosie, Daisy, Mrs Higgler and Mrs Dunwiddy and Maeve Livingstone and the others. I love how all of them are vulnerable and human, even those – like Rosie’s mother – who don’t seem so at first. Anansi gave his name to stories. Every story is Anansi’s. Once, before the stories were Anansi’s, they all belonged to Tiger (which is the name the people of the islands call all the big cats), and back then the tales were dark and evil, and filled with pain, and none of them ended happily. But that was a long time ago. These days, the stories are Anansi’s. What Tiger and Bird Woman represent is a world before stories, and that’s why they’re so scary. Well, maybe not exactly before stories, but before the kind of stories we tell today, stories that are inventive and funny and happy and sad, stories that stay with us, stories we tell again and again, stories that shape our lives. This deep belief in stories and in the fact that they’re a crucial part of what being human is all about really resonates with my own way of looking at the world. And I keep finding examples of it in Neil Gaiman’s work. The Sandman is perhaps the most obvious example, but there are others. I think I’ve said this before, but this is a big part of the reason why he’s my favourite author. I enjoyed Anansi Boys even more this time around. I really ought to re-read my favourite books more often. There were certain things I feel I only appreciated properly now, because now I’ve read collections of West African and Caribbean folklore and Zora Neale Hurston and Nalo Hopkinson. And I did that, of course, after reading Anansi Boys for the first time. I love the way I kept finding new details in the book. For example, Grahame Coats, Fat Charlies’ obnoxious boss, talks in clichés. And that’s really annoying, and the first time around all I thought about it was that his clichés were one of the things that made him so annoying. But this time I started thinking that maybe there’s more to it than that. Clichés are uncreative, and creativity is Anansi’s. And Grahame Coats is more Tiger’s than Anansi’s. Perhaps that’s one of the reasons why his very use of language is so uninventive. Of course I can’t really know if this was meant to be read like that, but that’s the beauty of being a reader. We can see whatever we want to in the books we love. Songs remain. They last. The right song can turn an emperor into a laughing stock, can bring down dynasties. A song can last long after the events and the people in it are dust and dreams and gone. That’s the power of songs. Stories are like spiders, with all they long legs, and stories are like spider-webs, which man gets himself all tangled up in but which look so pretty when you see them under a leaf in the morning dew and in the elegant way that they connect to one another, each to each. or Reading Dangerously or whatever it's called. I never reread books...that's really sad. I should. Especially more rereads of Gaiman. His books are some of my favorites and I remember this one fondly. Though I'm sure I've forgotten many details. I do remember the bit about the lime that just totally cracked me up :p You're so right, he's a master at portraying how important stories and story telling are. I remember that about this one. This one is burning a hole on my bookstack... I'll get to it this year! Thanks for the excellent review, now I want to read it more than ever. I do love this book. I actually gave it (and Good Omens) to my brother for Christmas this year to spread some Neil Gaiman love. I've never read any Neil Gaiman, but I've been wanting to read The Graveyard Book. After your review, I think I'll start with Anansi Boys. You know how badly I want to go pull this off the shelf now, don't you? Yes, of course you do. You do this to me with ever review you write! And this time the urge might possibly be even stronger, as I loved American Gods so very, very much. Oh man. I loved this book!! Then again, I've loved every Gaiman book that I have read. I wish I could pick a favorite. It might have to be American Gods, since it was the first one I read. Or maybe Neverwhere....or Stardust....or, well you get the picture!! Your review makes me want to read this, as well as Terry Pratchett. Argh! Every time you review a book I loved, I find myself wanting to grab it off the shelf and reread it right now. I love what you have to say here about Graham Coats and the whole Tiger/Anansi dynamic. Thanks for your insightful review, Nymeth! Is this one better than American Gods? I loved Coraline but didn't particularly enjoy AG, and I'm planning to read Stardust next year. The jury's still out on Gaiman for me. I should try this one, I think. Lovely review, Nymeth. Ididn't wish for you to shut up so fast though. LOL. Thanks for leaving us with wonderful passages from the book. OK, you've just inspired me to make this my Christmas Eve read! It's a while since I read it and you've noticed things that I didn't have a clue about, so now it's winking at me from the bookcase. It's testament to a fab review when all the comments are from people going off to read the book! Thanks :) If I don't pop back before the 25th, Merry Christmas! oh...I can't tell you how many times I have picked up this book at the bookstore and kept it down again. Something stopped me from buying it. Glad you liked the book, I might actually buy this one next time. What a fun review! It surprised me how much more I enjoyed Anansi Boys and American Gods, even though the former is something of a sequel to the latter. American Gods was heavy and structureless (plus I didn't buy the whole people-make-dieties conceit); Anansi Boys was just plain fun. This is the Gaiman I've 'read' the most, because I have it on CD. The audioversion is just incredible!!! :) Anyway, I think it might be my favourite too. Bart and Daphne, I hope you both enjoy it! Megan: yay for spreading Neil Gaiman love! 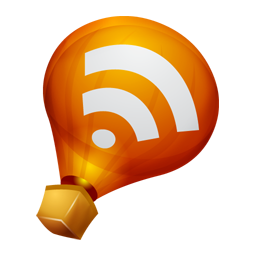 Bermudaonion: I think this would be a good starting place. It's sometimes referred to as a sequel to American Gods because that's where Mr. Nancy first appears, but the plots are completely separate and you don't need to have read one to enjoy the other. Debi: I'd say sorry, except I'm NOT sorry :P The mood of this one is different from American Gods...most of the times it's lighter, except that the dark bits are really quite dark. One thing they have in common is the same sort of, er, mythicness? Anyway, I really think you'll love this too! Memory: Do read it right now :P You know you want to :P And I'm glad you liked it! Amanda: I honestly can't pick...I'm one of the worst people to ask which one is better because I really love them all... it's like having to pick my favourite child. Except I don't have children, so make that my favourite cat :P I can say, though, that it's very possible that you'll enjoy this even though you didn't enjoy AG. It's a different sort of book, with a different mood. Also, it's really, really funny! Alice: I normally write my posts on Word, and when I notice that what I'm writing is over 3 pages long, I tend to suspect it's time to wrap it up :P This is one of those books I could go on and on about. Anyway, I hope you enjoy both this and AG! Violetcrush: I hope you do get it next time! Loren Eaton: I actually really love that concept! He uses it in Sandman too, and so does Terry Pratchett in books like Small Gods. It's something that appeals to me, though of course I understand that it wouldn't work for everyone. Anyway, all this harshness on AG makes me sad :P I agree with you that this one was more fun, though. Eva: I'm really curious about the audiobook! I remember Neil Gaiman saying how happy he was with the narrator and the incredible job he did. Great review! I love Anansi Boys, too, especially the folklore/storytelling aspect of it. That seems to play a lot in Gaiman's novels. Nice review. This makes me want to reread the book. I haven't ready any Gaiman, but after reading your review, I think I should get on it already! I just shared the fact that after rereading this I think I wanted to talk to spiders. And that my friends, while they understood why, laughed just the same. Or something to that effect. I wish I could express myself as well as you do, Nymeth. I love your reviews. I'm looking forward to reading this one very much. Neil Gaiman is such a great author. I don't want to be too harsh on American Gods. After all, Gaiman at his worst is still pretty darn good! Jessi: It does, doesn't it? I love that about him. Shannon, I'm glad to hear it! 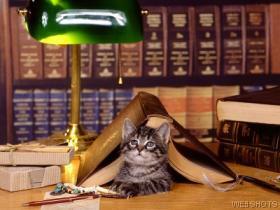 Literary Feline: I could tell you the exact same! I absolutely love the way you write, the way you express yourself. Loren Eaton: Very true, that! I loved this book! And your post made me remember why I loved it so much. Although, my favourite Neil Gaiman will always be Neverwhere, probably because it's the first book I read by him. Because I always think of Neverwhere as my "favourite", I sometimes forget how much I love his other books. I am so glad you enjoyed this one. I've read mixed reactions from different people. I absolutely loved it and I think one of the reasons, besides the fact that I love Neil's writing, is that the various things this book is an homage to are all things that I really enjoy. I found pieces of types of stories that have long been favorites. And Daisy is just wonderful. I fell in love with her right from the start. Would love to see Felicia Day play her in a movie version! If you ever get a chance to listen to this on audio you are in for a real treat. The reader gets the voices and everything so right that it makes the story come alive even more. I loved this one, too - and I can certainly see myself rereading it in a few years. I echo Carl's words - it's one of the best audio books I've had the pleasure of listening to! I love your thoughts about the cliches - I think they're right on target. And I definitely plan to read more books by Gaiman in 2009! I liked this one. It and American Gods are the only Gaiman books that I've gotten around to reading though. Fell in love with Gaiman as a writer through "Neverwhere" and then went onto "American Gods" as I knew that was his big epic masterpiece, but I didn't like that one so much, it was a bit dark and sprawling - I did like it, but it was quite hard to get through. Then I picked up "Anansi Boys" as a sort of sequel and loved it almost as much as "Neverwhere." You have crystallized so much of what I've been thinking about Anansi Boys. I'm sitting here trying to get an angle for my paper comparing Anansi Boys to the original folklore. It's been niggling at me for weeks as I reread Anansi Boys and Anansi stories and discover Anansi stories I hadn't read before. He is, by far, my favorite God. He is one of the few gods who gets credit for creating mankind, giving us creative thought, being fallible, and a folk hero all wrapped into one (just for starters). You've included some of my favorite quotes in your examination of the book, and I think I'm ready to jump in. Gaiman has a way of taking a multitude of stories, myths, and legends about a god/mythological entity/folklore character and condensing them into a fully-realized, three-dimensional representation who could walk by you on the street with you being none the wiser. At least, I'd like to think Mr. Nancy is still out there crooning for karaoke night and naming things as he sees fit.